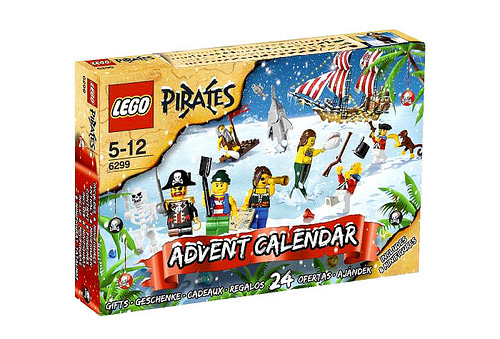 It has been leaked before, but kin.leg◎ recently discovered a good, official picture of the new Pirates Advent Calender. It shivers me timbers, yarr! Looks like we will be getting 8 figs, a monkey, and a sawfish. The grey sawfish hasn’t been in production since 1997, although a black one was briefly available in 2002. Here’s hoping it will be sold worldwide! EDIT (AB): According to the page on Amazon.co.jp, the set will retail for 5,775 yen, so my guess is that it’ll be a $30 set. Like 10199 LEGO Creator Christmas, it’s scheduled to ship from Amazon Japan on October 25, 2009. The amazon page also shows one of the new sharks as well! Nothing new, but still very cool. Let’s hope LEGO learns from Castle Advent Calendar last year and releases this everywhere. If this is released everywhere, that’s going to be awesome. I’ll definitely get this if it is. Buying this set is like buying all of the minifigures from the other sets! The only bad thing is that there’s no admiral. A better looking mermaid, and a sharkman were in a $20 Harry Potter set. I rather they just release the Castle one from last year, it was so much better.